A romantic fortune cookie is a surprising way to send a personalized message to someone you love. Finish a romantic dinner with one of these sweet sentiments or present a thoughtfully prepared package of them after take-out dinner on a hectic day as a reminder of how much you care. Hide your own message inside homemade fortune cookies. Store-bought fortune cookies are simple to decorate but changing the messages inside is not. Instead of attempting to wrestle messages out of cookies without breaking them to add a personalized note, look for romantic themed fortune cookies or bake your own at home. Fortune cookie batter is very thin and if you make your own, you can add a few drops of food coloring to add color to the cookies. The batter is then spread out into a three-inch to five-inch circle on a baking sheet. Immediately after baking, place your fortune in the center of the cookie and fold it in half. 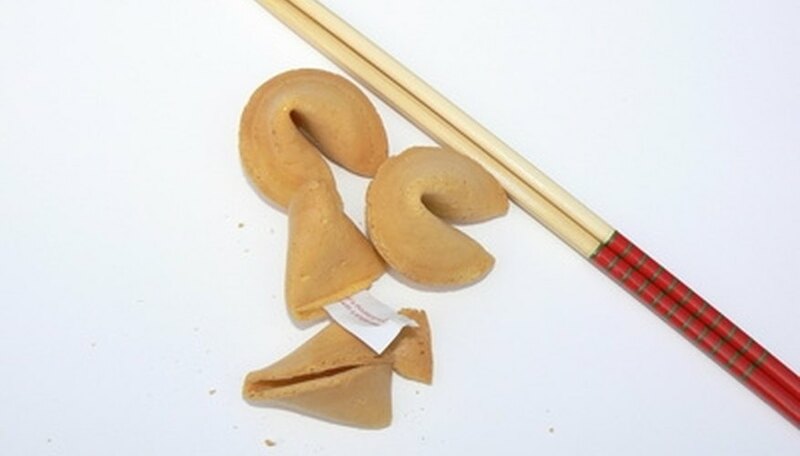 Bend the folded cookie to create the familiar shape of a fortune cookie. As long as the cookie is warm, it will remain pliable but will become crisp and stiff as it cools. Write your messages with a pen on a heavy paper such as parchment paper or craft paper. The warm fortune cookie may be slightly oily due to the butter in the recipe which could make the paper wet. Heavy paper should be able to withstand the small amount of oil while thin paper might begin to dissolve. Dip the folded end of each fortune cookie into melted chocolate or candy coating. Immediately dip the chocolate covered part of the cookie into pink and red sprinkles or small candy hearts and let it dry on wax paper until the chocolate is cool and firm. White, milk and dark chocolate work fine can all be used. Melt these chocolates in the microwave at medium power for 1-1/2 minutes and then stir the chocolate. If necessary, continue to heat at 30-second intervals until the chocolate smooth. Candy coating allows you to easily add more color to the fortune cookies. Purchase a Chinese take-out style box from a craft store to hold your romantic fortune cookies. You may be able to find decorated or colored boxes to suit your cookies or you can purchase a plain box and embellish it with a brightly colored ribbon. Layer a few sheets of tissue paper in the bottom of the box and set your fortune cookies gently inside to prevent them from crumbling before you present them to that special someone. McCoy, Kittie. "Romantic Fortune Cookie Ideas." Dating Tips - Match.com, https://datingtips.match.com/romantic-fortune-cookie-ideas-6301709.html. Accessed 25 April 2019.